Dawe & Son, Grocers and Provision merchants, occupied a central location in the Borough for the last half of the nineteenth century. Dawe & Son's grocery - next to the Wilts & Dorset (later Lloyds) bank in the Borough - was earlier the grocery of Charles Gardiner established in 1840 and mentioned in trade directories of 1850 and 1852. By 1861 this establishment was being run by 35-year old grocer William Worner who lived above the shop with his wife Eunice, their three children, two grocer's assistants, three grocer's apprentices and two house servants. One of the grocer's assistants was 21-year old James H Dawe. Certainly by 1875 James Dawe had taken over Worner's premises and was listed in the Post Office Directory of 1875 as a grocer of High Street. He was listed almost annually in Whitby's Yeovil Almanack Advertiser as a grocer and provisions merchant of 10 High Street, latterly known as the Gun Tea Warehouse. In 1899 the Dawe family retired to Folkestone, Kent although ownership of the shop clearly remained in the family. It was listed as JH Dawe & Son in Whitby's Yeovil Almanack Advertiser of 1903 and there were two final trade directory listings, both in Collins' Yeovil Directory of 1907 and both listings simply as Dawe & Son, one as a grocer and provisions dealer, the second as a wine and spirits merchant. 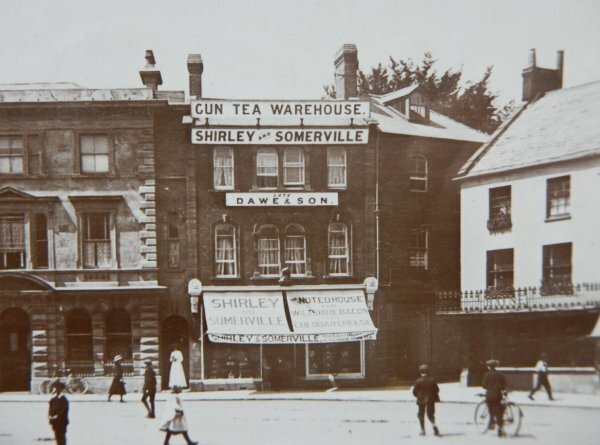 Certainly during 1907 the 'Gun' Tea Warehouse was being operated by Shirley & Somerville as evidenced by the advertisement and dated postcard in the Gallery. George Shirley was born in Radford, Warwickshire, in 1872. He was the second eldest of the five sons of labourer William Shirley and Harriett née Cooper. In the 1881 census 9-year old George was living with his family in Leamington, Warwickshire. By the time of the 1891 census George was living with his grandparents, Daniel and Hannah Rose, at 14 Hampton Street, Leamington. He gave his occupation as a 'China Merchant's Assistant'. During the winter of 1896 George married Sarah Warwick (b1872, Heywood, Lancashire) at Leamington. 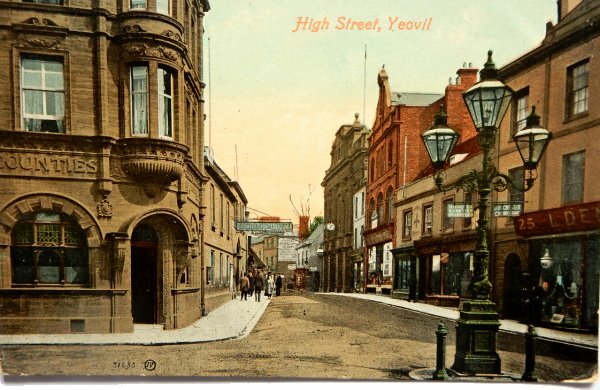 By 1901 George and Sarah had moved to Yeovil and were living, with a 14-year old domestic servant, at 21 High Street where George was the manager of a china shop next to the Town Hall (roughly where Argos is today). In 1902 George and Sarah had a daughter Gertrude Mary, who was born in Yeovil. John Henry Somerville was born in 1874 at Walsall, Staffordshire. He was the son of political organising agent William Somerville and Anne née O'Dowd. In the 1891 census 17-year old John was living with his parents and siblings at South Claines, Worcestershire. He gave his occupation as a grocer's apprentice. By 1901 John had left home and had moved to Gloucester, Gloucestershire, where he lived in lodgings and worked as a grocer's assistant. In the summer of 1903 John married Adeline Blanch Ralph (b1875) at Keynsham, Bristol, where they had two children; Henry Ralph (b1905) and Raymond John (b1907). In 1914 they had a daughter Adeline who died in 1934 aged 20. 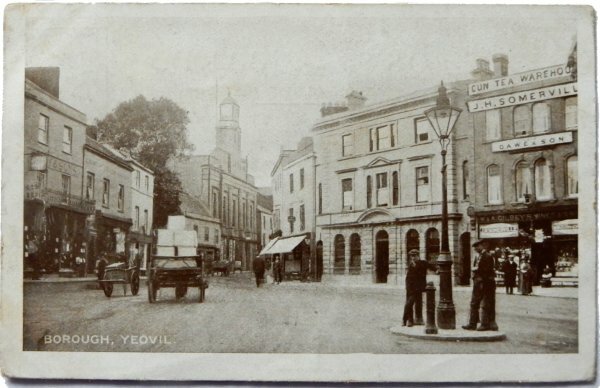 John moved his family to Yeovil in 1907 and went into partnership with George Shirley during the latter part of that year. A series of weekly advertisements (see Gallery) appeared in the Western Flying Post for "Shirley & Somerville's 'Gun' Tea Warehouse - late Dawe's". Shirley and Somerville leased the shop in the Borough that had been run by James Harris Dawe who died in the spring of 1907. Shirley and Summerville were listed in the 1910 edition of Kelly's Directory as 'Grocers of 10 High Street'. However in April 1910 the estate of James Dawe was sold off (see Gallery), including the premises being leased to Shirley & Somerville. It is believed that John Somerville purchased the property and that the partnership of Shirley & Somerville came to an abrupt end. George Shirley left Yeovil. In the 1911 census he was listed as a 'China & Glass Dealer' at 36 High Street, Ross, Herefordshire. Sarah was listed as 'Assisting in the business'. In the meantime John, Adeline, their two sons and a servant were living above the Borough shop premises - albeit listed in Church Street in the 1911 census. John gave his occupation as 'Family Grocer, Wine, Spirit and Provision Merchant'. He was listed as a Grocer of 10 High Street in Kelly's Directory of 1914, as a 'Grocer, Tea, Wine & Spirit Dealer' in Kelly's 1919 edition and once more as a Grocer in the 1923 edition. 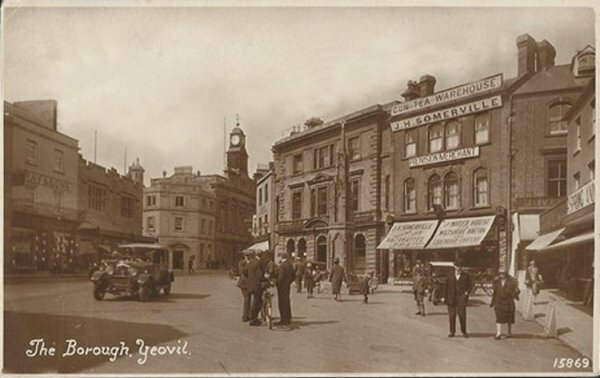 In November 1915 John Somerville was appointed to the Recruiting Officers' Advisory Committee for the Borough of Yeovil. In the autumn of 1916 John's wife Adeline died. She was aged 41 and left John with three young children. In the autumn of 1919 John married Florence Champion Hayne (1882-1960) at Yeovil. Florence was the daughter of butcher John Coombs Hayne and his wife Emily - the Hayne's butcher shop was next door to John Somerville's shop in the Borough (see Gallery). Beginning in 1917 and running into the 1920s Florence ran the Somerville School of Dancing and managed a junior entertainment group called the "Merry Little Entertainers" and put on at least seven annual shows at the Assembly Rooms in Princes Street as an annual fund raising effort for the hospital. In its edition of 17 April 1925, in praising Florence's seventh annual show in a lengthy article, the Western Chronicle reported "In order to make any entertainment successful, efficient organisation and careful training is most essential and in Mrs Somerville is to be found a capable, energetic and enthusiastic leader, whilst Mr Somerville appropriately looks after the business side." In something of a radical change, in Kelly's edition of 1935 John was listed as proprietor of the Princes Café at 22 Princes Street in the 'Restaurants, Cafés, etc' section. John Henry Somerville died on 21 October 1936 at the Princes Café, Princes Street. He was aged 62. His will was published the following May and his effects were valued at £4,716 1s 5d (around £1.3 million at today's value). Florence died in Yeovil in 1960, aged 78. A hand-coloured postcard of High Street, this one postmarked 1910 but I've seen this card used as early as 1906. By 1901 George Shirley was the manager of the china shop located in the white building, right of centre and nestled between the Town Hall and Clements & Son's	building in red brick. 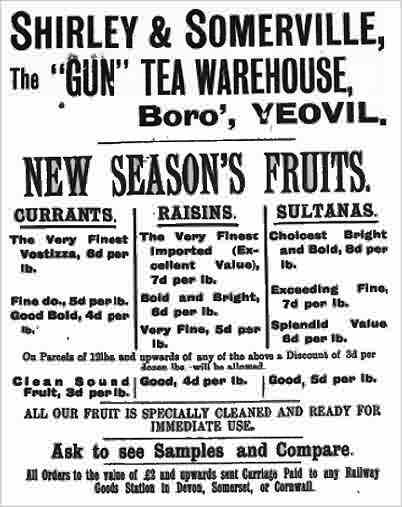 One of many identical weekly advertisements placed in the Western Flying Post during the latter half of 1907 for Shirley & Somerville's 'Gun' Tea Warehouse. This postcard of the Borough was posted in 1907. Note the "Gun Tea Warehouse". By this time these were the premises of Shirley & Somerville "formerly Dawe & Son". From a postcard of around 1909. At right is the butcher's shop of John C Hayne - after the death of his wife Adeline, John Somerville was to marry John Hayne's daughter Florence. 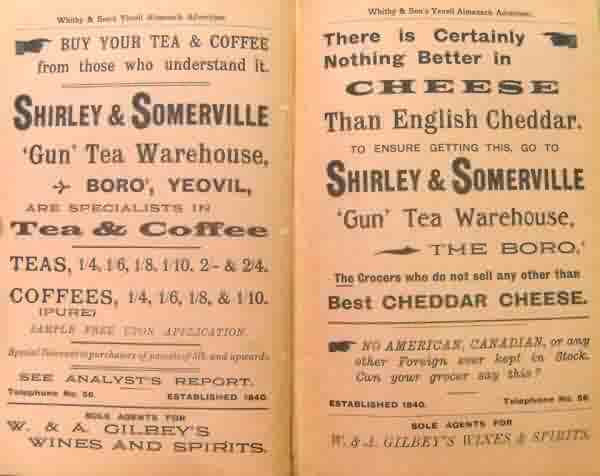 Shirley & Somerville's two-page spread in the 1910 edition of Whitby's Yeovil Almanack Advertiser. The partnership dissolved the same year. Note the claim "Established in 1840" which actually referred to a grocery in the building 67 years before Shirley & Somerville went into partnership! 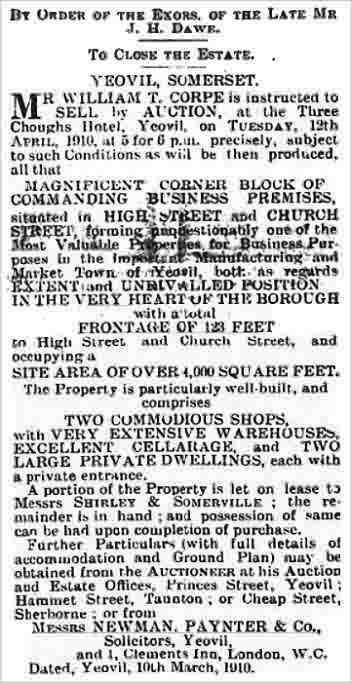 The notice of sale of the property leased by Shirley & Somerville from the 1 April 1910 edition of the Western Chronicle. It is believed that John Somerville purchased the property, bringing the partnership of Shirley & Somerville to an end. A postcard of the Borough, sent in 1918. By this time John had been trading on his own for some eight years. 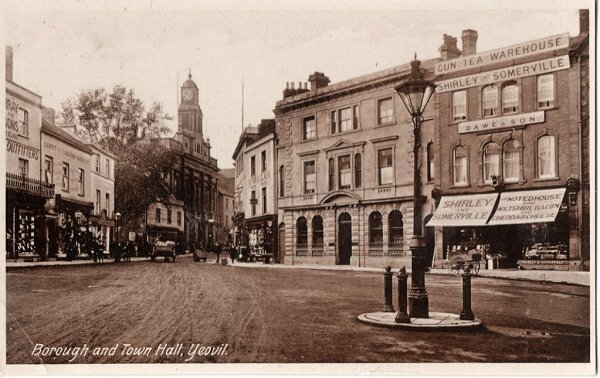 A postcard dated 1929 looking across the Borough towards King George Street.